Welcome Back! We hope you have a great year at MHS! French Club Fundraiser: Eat great food and support French students traveling to France this year. Boonie’s on the Avenue is donating 20% of all they take in on from 5:00 ‐11:00 on Tuesday, Sept.1, toward this trip. Bring your family and friends and enjoy the food and atmosphere while you help provide a great experience for these students. Auditions for the MHS Fall Play, “A Murder Is Announced”, will be held on Thursday, 9/3 and Friday, 9/4 in the auditorium starting at 3:30 pm. Detailed information is available on the drama website, www.muskiedrama.wordpress.com, or you may e‐mail Mrs. Mauck (rene.mauck@mcsdonline.org) for the google doc link. “A Murder Is Announced” is a classic Agatha Christie murder‐mystery plot with a great mix of suspense and humor to lighten the tension! Show dates are November 6 and 7. Contact Mrs. Mauck with questions. Model UN: Those interested in participating in Model UN this year should attend the Kickoff Meeting in Ms. Hansen’s room (11‐024) on Wednesday, September 2 at 8:00am. Key Club: Join the nation’s largest student‐led service organization! Members have the opportunity to volunteer in the community, build character, and develop leadership. Come to the Key Club Kick Off Meeting on Friday, September 4th at 7:30am in the Auditorium to learn more. 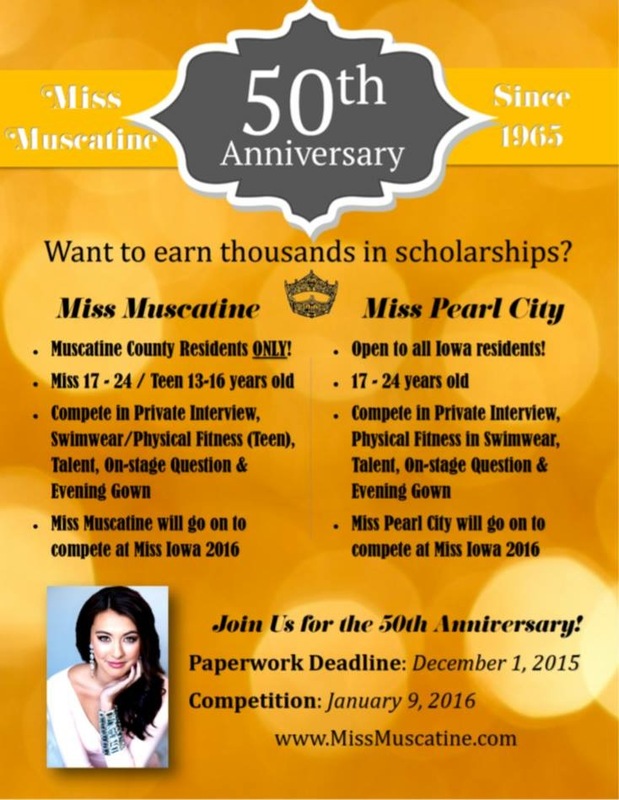 Miss Muscatine & Miss Pearl City – Please see the attachment for more details. United Way of Muscatine is looking for volunteers to help work at their campaign kick off on September 15th at the Pearl City Station. 3pm-5pm-Set up, 5pm-7pm- Lead games and craft activities, 7pm-8pm- Clean up. Volunteers can participate for one or all sessions. All volunteers will receive a LIVE UNITED t-shirt. Contact Kim at 563-263-5963 or kim@unitedwaymuscatine.org to sign up or for more information.